Freedom of press is one of the indicators of a free society (e.g., immunity of communications media from censorship or governmental control). Freedom House’s 2012 analysis of Freedom of Press found that only 14.5% of the world’s population live in countries with a free press, while 45% have a partly free press, and 40.5% live in an environment without a free press. As for the South Caucasus region, Georgia was classified as having a partly free press ranking 111 out of 197 countries, similar to Bangladesh, Kenya and Mauritania which were among countries classified as partly free. Both Armenia (rank 149) and Azerbaijan (rank 172) were classified as having a “not free” press. This blog discusses the changing situation with regard to media freedom in the South Caucasus, as well as perceptions of trust in the media. It also highlights a gap between media freedom and trust in media in the region. The Freedom of Press survey was first conducted in 1980 and has annually assessed the level of media freedom and editorial independence worldwide ever since. Freedom House provides analytical reports for 197 countries and territories and assigns them with a total score from 0 (best) to 100 (worst). The score is composed of 23 methodological questions that are divided into three categories: legal, political and economic environment. Primary attention is given to the political environment for press circulation, referring to the ability to operate freely and without fear of persecution. The degree to which each country permits the free flow of news and information determines the classification of its media as “Free,” “Partly Free,” or “Not Free.” Countries scoring 0 to 30 are regarded as having a “Free” media, while scores of 31 to 60 indicate “Partly Free”, and 61 to 100 represents “Not Free”. In 2012 Georgia was the only country to make significant improvement in the region of Central and Eastern Europe and Eurasia – it moved from 55 to 52 points (out of 100). This was primarily due to the establishment of new publications, the issue of a broadcast license to a media group critical to the government (TV9), and enforced provisions for media ownership. However, a few deficiencies have remained. For instance, the Georgian National Communications Commission has been broadly reported to have limitations, delays in the access to information, and a lack of independence from political parties. The report also identified Azerbaijan, Russia and Kazakhstan as countries of special concern in the region (i.e. not free). Freedom House’s country overview of Azerbaijan explains that journalists continue to be persecuted and imprisoned, authorities use economic and political pressure to maintain control over major media outlets, and the 2000 Law on Mass Media remains inoperative. In Armenia, press freedom also remains restricted. The media environment remains controlled despite several amendments and legal protections that have been in place since the 2008 presidential election. In addition, close ties between government authorities and media owners encourage journalist self-censorship, particularly in the broadcast sector. Freedom House data also allows us to follow its Freedom of Press index over time. According to the index, freedom of press has worsened (again, 0=best and 100=worst) in Armenia and Azerbaijan since 1994. Furthermore, while press freedom in Armenia has worsened from 1994 to 2009, there was a slight improvement from 2009 to 2012. 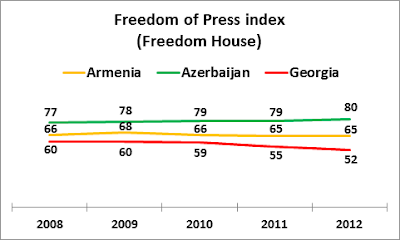 The freedom of press index has fluctuated more in Azerbaijan, although it steadily deteriorated from 2004 to 2012. Georgia’s index sharply improved from 1994 to 2000, after which it worsened from 2000 to 2009, and began improving again from 2009 to 2012. It is also difficult to find a direct link between changing freedom of press since 1994 and trust in the media. 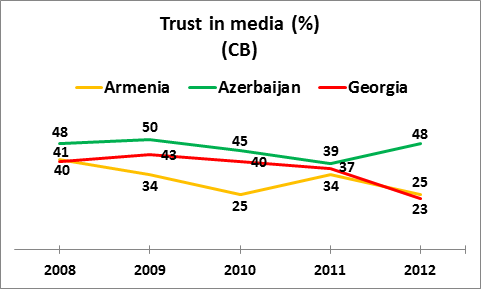 According to the Caucasus Barometer (CB) survey, the level of trust in the media has also varied in these countries from 2008 to 2012. The overall picture that emerges after combining results from the CB and the freedom of press index is interesting. Although the Freedom of Press index has slightly worsened from 2011 to 2011 in Azerbaijan, trust in the media during that period sharply increased. 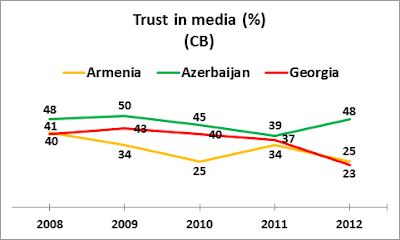 On the contrary, Georgian trust in the media has decreased since 2009 although the index of freedom of press improved. Thus, the freedom of press index does not directly tell us much about how much societies trust media. The South Caucasus has not yet achieved a completely free press. 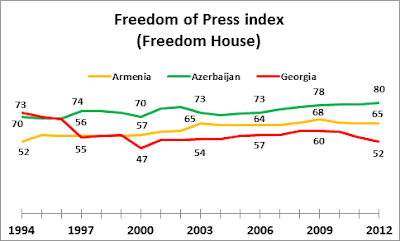 However, according to Freedom House, freedom of the press index is improving in Georgia, whereas the index is stable in Armenia and worsening in Azerbaijan. This blog discussed major criticisms about the press environment by Freedom House, as well as the interchanging level of trust in the media in the South Caucasus. You are invited to see the full 2012 Freedom House report and to find out more about trust in institutions using the CRRC Caucasus Barometer.